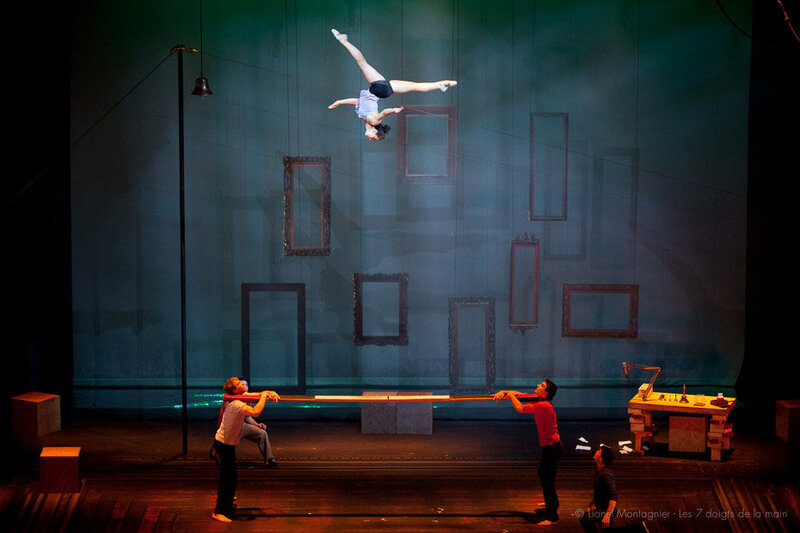 Sharing the same origins as the recognized Cirque du Soleil, The 7 Fingers (Les Doights de La Main) are dedicated to bringing circus performances to a human scale. Exemplified by their disassociation from circus extravaganza such as large and glamorous performances, Sequence 8 connects to the audience through their humane and recognizable synergy. The performers’ interaction with the audience breaks down the conceptual boundaries of the spectator and the performer, creating a performance that is one of a kind and truly a result of the audience’s contribution. Frequently categorized as a dance performance, Sequence 8 is undoubtedly more than that. Consisting of acrobatics, juggling, balancing acts, Russian bars and Chinese pole skills, The 7 Fingers have managed to reestablish the boundaries of a traditional glamorous circus show into a nouveau performance of a circus troupe fused with contemporary dancing and audience intimacy. The show is presented in part of the Push Festival taking place at the Vancouver Playhouse. With the show commencing at eight-o-clock, it is obvious that many have come a long way specifically for this show. The hallways are bustling with ecstatic spectators and outside the theatre, a long line has formed around the block for last minute rush tickets. As the bell rings signaling the audience to take their seats, a rush of an eclectic audience scurries inside, scavenging to their seats and fill the large theatre with a surge of abundant energy. Usually, the Vancouver Playhouse house mostly dance performances and has a proscenium configuration. For Sequence 8, it is interesting to note that the configuration remained the same except for the change in the ceiling height. Usually dance performances are without any acrobatic elements so in order to accommodate the height the performers need when they’re performing tricks such as the Russian Bar or Chinese Pole climbing, the Playhouse reconfigured the ceiling height exposing it to its maximum of thirteen meters. The show is a ninety-minute performance with no intermission full of dancing, acrobatics, storytelling and good comedy. The “ringmaster” Colin Davis sets the mood of the performance right away as his opening remarks of no cellphones or photography quickly transforms into a good comedy routine. With the audience now mesmerized with this unexpected comedy, the show commences with the eight performers taking the stage. Each of the eight performers is highlighted in their skill as they shock the audience with each of their specialty. Alexander Royer bounces her way to the top on the Russian bar, elevating every single one of the audience heart beats with her jaw dropping flipping and pristine landings on the beam. Camille Legris and Tristan Neilsen prove their award winning balancing technique as this dynamic duo majestically performs their balancing act flawlessly, exerting elegance and fluidity as if they were weightless entities. Circus trained performer Maxim Alexander ferociously proves to be gravity defying as he races up and down the Chinese pole with no difficulties and shockingly versatile as he accompanies Ugo Davis on the Korean Board, flipping their bodies away in acrobatic harmony. Furthermore, the hilarious Eric Bate steals the show with his cigar box juggling routine in which his reputation as one of the best in the world does not fail the audience. The collective energy and trust of this group of performers is noticeable and almost infectious as they perform their routines. There is not one moment the performers are not focusing as one mistake can lead to a fatal injury. What the performer feels, the audience does too, creating an emotional connection between the spectator and the performer bounding them as one. More so, if one performer would fall, which it did happen throughout the show, their teammates are there to support the fallen one as he or she regains their strength and bravely attempt the trick again. The familiar emotions of disappointment, urgency and panic when their team member falls are recognizable as this humane reaction symbolizes that they are undoubtedly still human and makes it relatable to the audience. This is the connection of authentic truth in this performance that no other performance does. Regardless if they are professional or not, human beings are prone to mistakes and just because they are professionally trained to complete those tricks doesn’t mean they are always perfect. This is humanity. Characteristically, all of these high-risk routines are accompanied by a dose of humor as each excerpt is intertwined with ringmaster’s Colin witty improvisation. He questions each of the artist’s skill, asking them questions the audience thought of and the audience’s opinion of the performer’s routine. From these small talks, the audience learns about the performer’s lives, their past, ambitions and their reasoning behind performing. We come to learn about these performers on a personal level deeply connecting to them intimately. Often when watching grandiose circus shows such as Cirque du Soleil, the show is very much about the extravagant production- costuming, stage props and not much is emphasized on the audience’s participation. The audience is very much disassociated and only present as the spectator and nothing more than watching the performers perform. 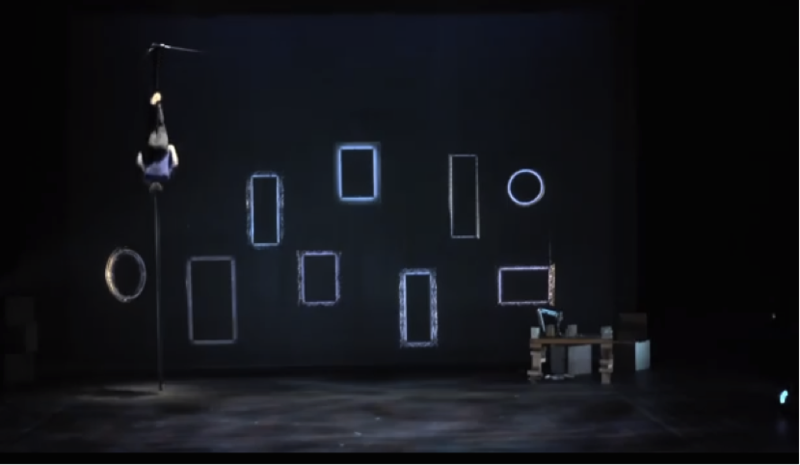 In Sequence 8, the show’s structure is at its bare minimum with a few frames as the backdrop and the Chinese pole mounted as the main scenery. Other than that, the costumes are simple, as the performers wear street clothes with no glitter or glamour except the shining talent of the performers itself. 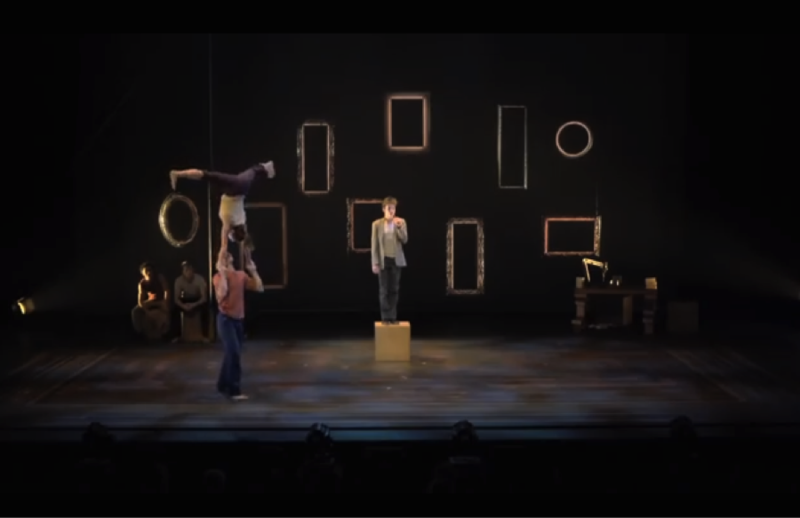 Even though Les Doights de La Main share the same origins as Cirque du Soleil, it is inevitable to conclude that the two are ultimately opposite. Dedicated to bringing circus performance to a human scale, The 7 Fingers are infectious with their ability to connect to the audience and break down the conceptual boundary that the audience has to maintain only as a spectator. Combining the excitement of an all around skillful show with the attributes of intimacy and complex dancing, The 7 Fingers grasps the audience’s attention, flinging them up in the air, leaving them wanting more from the ever-stunning performance of Sequence 8.